Peshawar Zalmi is a franchise team in Pakistan Super League and also one of the five founding member of the tournament. They have won PSL title once that makes them as the defending champion of the tournament. So, they have started the 3rd season of Pakistan Super League as one of the hot favourite team. The team Peshawar Zalmi represents Peshawar in the tournament. The team Peshawar Zalmi on the way to playoff in the ongoing season and as per to do so, they have defeated Karachi Kings in their last match. On the other hand Karachi Kings started the season of Pakistan Super League 2018 very good and managed several victories. They have also the chance to qualify for the knockout event of the tournament. Earlier this team did not make any remarkable entrance in the tournament. But this time, they are in very good position and it would be very possible for them to win the next title of PSL. If we look to the Peshawar Zalmi in PSL, they have managed four victories already and to secure their position in playoff, they need to manage one more victory in the season. On the other hand, Karachi Kings have won four matches as well but they lost four matches so, they are in the same position and needed a victory. Both teams have one match still in hand and both of them will try to manage a victory in their next match. 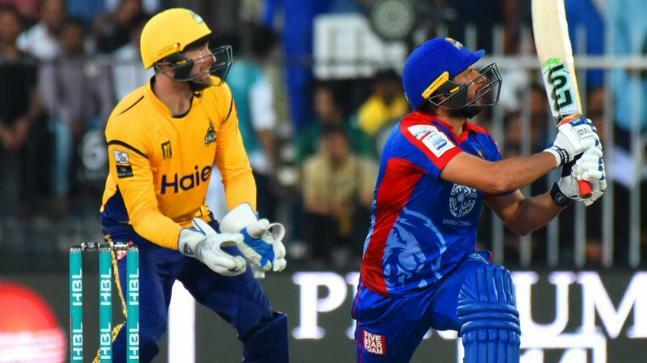 The match between Peshawar Zalmi and Karachi Kings was the 27th match of the ongoing season of Pakistan Super League 2018 and the match was staged in 15th March, 2018 at Sharjah Cricket Stadium, Sharjah. In the match, Karachi Kings got the real option to take advantage and they came to bowl first by losing the toss. In most of the cases, the toss winning team used to go for the bowl first but Zalmi took the opposite decision. But it was proved better when they got the amazing victory over the most charming team in the tournament. Peshawar Zalmi started to bat first by winning the toss and losing six wickets they did able to present 181 runs in front of Karachi Kings. From last couple of matches, chasing in the ground seems much difficult and Karachi Kings felt the same problem. They lost eight wickets in 20 overs and finished their innings scoring 137 runs so far. So, Peshawar Zalmi won by 44 runs against Karachi Kings.